Happy Laundry Day! I am back in London and currently listening to the hum* of the washing machine on the first of many loads. 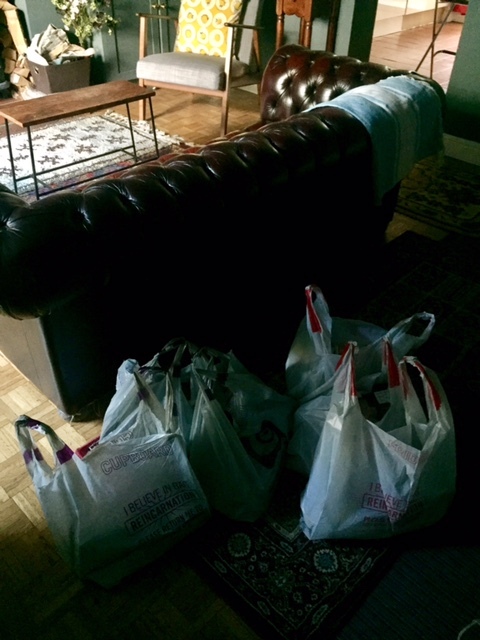 Today is Catch Up Day: laundry, emails, a meeting, a grocery delivery. All necessary tasks before heading to Scotland tomorrow - Kirkcudbright, specifically (pronounced kir-koo-bree, natch) - for a weekend with MumBetty. Oooh, groceries are arriving! Hold on. I never let the delivery guys carry the bags all the way to the kitchen because I already feel guilty they've had to haul a crate down a flight of steps just to get to my front door. Instead I get it all dropped in the living room, where I can easily forget about it until I remember that I've ordered perishables, at which point I go sprinting back - from wherever I am in the house, doing More Important Things - cursing myself and the carton of milk trying to ruin my life. Every two weeks I play this game, proof that I have reached an age in which I've quit learning. You know what's in this week's bags? READY MEALS. So I actually have to be quick about unpacking them today. Right after I blog. And you know what else this means? A ROUND OF FREEZER TETRIS. There's no way there's room in there for all of it. And on top of that, they need to be stacked front and center where Al can easily find them next week (he's not one for rooting around). Already it's so full that when I open the door, bags of frozen miscellany cascade down on me like a dull yet aggressive avalanche. SO THIS IS GONNA BE GREAT. Laundry One just finished, time to hang it to dry! Wait. Groceries first. Groceries first. I got this. *And by 'hum' I mean 'the kind of racket you'd expect of a twenty builders breaking tile with a jackhammer'. I swear the machine is trying to do a runner, inching across the floor in the direction of the door. I CAN SEE YOU, M8.